Unfortunately, Saturday's Food Drive at Stop & Shop has been postponed due to the strike. Thank you to the teams of volunteers who were planning to join us. We hope to have another date soon! We are officially postponing Saturday’s Feeding our Families food drive. This step has been taken in conjunction with our partners at Stop & Shop, NBC and Telemundo, and will ensure that a rescheduled event will operate smoothly and efficiently. We thank all of our team members who were planning to come out this weekend and look forward to working with you again at a future date. another time while we are open. Donations may be dropped off anytime between 9:00 am and 4:00 pm Monday through Friday. Please see our Wish List to find out what items we are in need of currently. 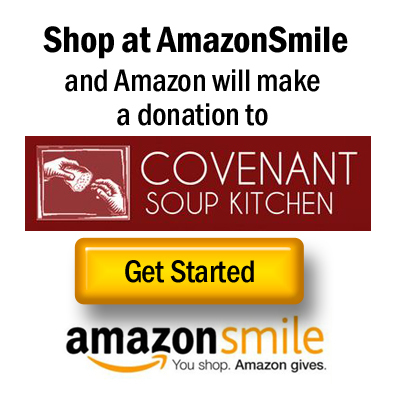 Monetary donations can be made online, mailed, or brought directly to Covenant Soup Kitchen. If you are interested in doing any kind of fundraisers or food drives for the Kitchen, please let us know so that we may help you advertise, or possibly provide assistance if needed. Thank you for helping us help our community! Donor information will never be shared or sold. Donors may request to see Covenant Soup Kitchen's IRS form 990 or Audits. Donors will receive appropriate acknowledgement of their gifts. Donors have the right to have their gifts remain anonymous, if desired. Donors have the right to ask questions when making donations and to receive prompt, truthful and forthright answers. Donor's gifts will be used for the purpose for which they are given, if a designation is selected, unless the donor authorizes a change to that usage.